Today's post continues our examination of non-transformative and transformative inks as they were used on the printings of the 1967-1973 Centennial Issue. Specifically, we will look at the 5c through 7c values. The vast majority of the printings of this stamp are in a transformative ink that comes very close to being black under UV, while a smaller portion of the stamps are printed in non-transformative inks that either do not appear significantly different under the lamp, or they merely appear deeper, without losing the essential character of their original colour. Today, we get into the inks used to print the Centennial issue, as they appear under, or are affected by long-wave ultraviolet light, or black light. Today's post will discuss what I mean by this, and then will look at some of the differences that appear on the 1c through 4c values of the series. There are two distinct groups of shades on this value. 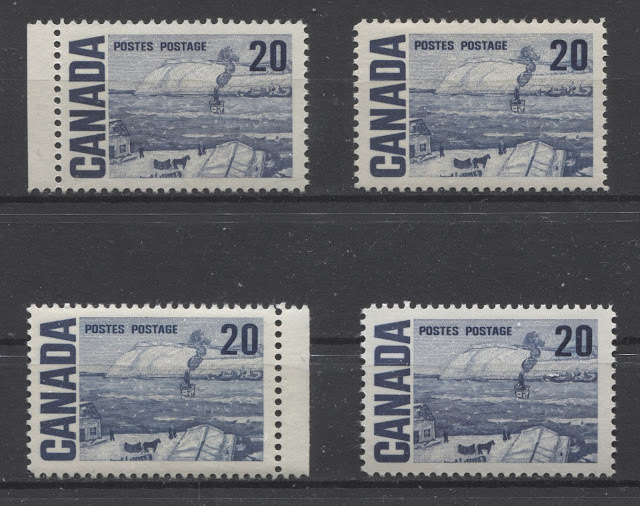 On the stamps issued with dex gum, the shades range from a steel blue to a deep blue and finally to indigo. This last shade contains quite a lot of black, and is very dark. The stamps issued with PVA gum tend to be printed with much brighter shades of blue, with the deepest ones being close to the brightest of those with dex gum. In comparing the shades on this stamp, I find the solid letters of "Canada" to give the best representation of the true colour. 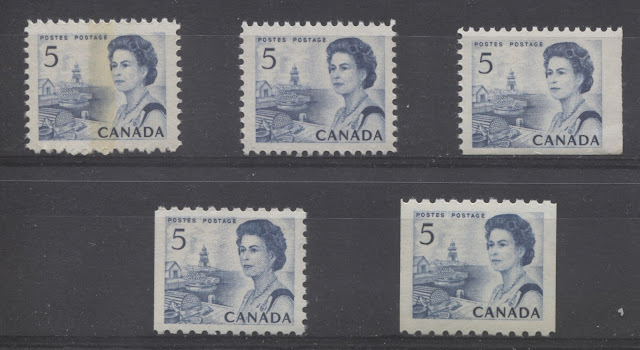 The top left stamp is a near perfect match to Gibbons's indigo. The stamp to the right of it is also closest to Indigo, but contains a touch less black, and is brighter.